If you’re reading this post, you’ve likely finished a manuscript for a children’s book (or have at least made the brave decision to start working on one), so congratulations are in order! Now that you have the most crucial part finished or underway, it’s time to start thinking about how to self-publish your book. There are fewer responsibilities that come with publishing your book if you choose to work with a traditional publisher, but there’s a reason you’ve chosen not to go that route—perhaps you couldn’t find a publisher who appreciated your niche subject matter, maybe you wanted to choose your own illustrator, or perhaps you’re like me and wanted to ensure that your book is eco-friendly and made with ethical labor. Whatever the reason you’ve decided to self-publish, you’re probably in the process of trying to wrap your head around all you need to do to ensure your book is properly published. 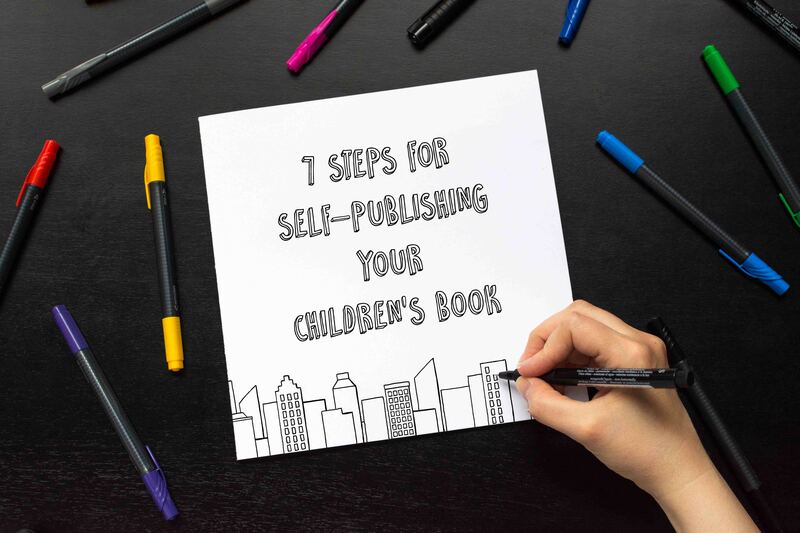 To help you get started, I’ve laid out 7 steps for successfully self-publishing your children’s book. This list is geared towards authors who plan to do most of the publishing work themselves, but also includes helpful information for those who are going with a full-service self-publishing company. It’s always a good idea to get unbiased feedback before self-publishing your children’s book. If you’re not a member of a critique group, consider joining KidLit 411 Manuscript Swap on Facebook. (KidLit411 also has a website and Facebook page that I’ve found to be invaluable resources.) I swapped my manuscript with half a dozen members in the group before working on a final draft, and I’m so glad I did. They pointed out concerns that family and friends were likely too polite to bring to my attention. If you have a rhyming manuscript, I recommend having people from different areas of the US (and even the world) do a read-through. Word pronunciation and meaning can vary quite a bit from region to region. I never realized how Southern my accent was until I went through the critique process. My critique partners helped me see that one of my couplets didn’t rhyme, and there were a couple of one-syllable words I had stretched into two-syllables that were throwing my meter off. If I had only asked local people to critique my book, I may never have caught those mistakes. In addition to swapping your manuscript with peers, I suggest getting your book professionally critiqued and edited. This is one area where you definitely don’t want to skimp. Hiring a skilled editor can take your manuscript from meh to remarkable and potentially prevent you from presenting embarrassing mistakes to the world. If you have a rhyming picture book manuscript, I highly recommend Renée LaTulippe or Lori Degman for a professional critique. They’re both masters of meter and provided me with invaluable feedback on my manuscript. As I stated in my post about printing an eco-friendly book, nailing down a printer (or choosing a self-publishing service) before beginning your illustrations can potentially save you a lot of time and frustration. Variations in color profile requirements as well as bleed, cut, and score lines can require you to edit your illustrations and reformat your book. Not all printers offer the same book sizes, so it’s important to know what your guidelines and restrictions are before investing time or money on illustrations. Most children’s books are 24 or 32 pages (this includes title page and copyright page). If you’re set on going with a different number, check with your printer first to see if they can bind that number of pages. There are minimum width requirements if you want a hardcover book or a perfect bound softcover book, and the number of pages (and thickness of the paper you select) can impact what type of binding you use. If you’re new to book design, I recommend hiring someone with experience to help you. If you’re intent on doing everything yourself, be sure to check out as many picture books from the library as you can and take notes on their appearance. If you can, get self-published books to compare to traditionally published ones. While professional-looking self-published children’s books do exist, they’re the exception. Missteps to avoid with illustration would be a lot to cover in this post, so I’m going to focus instead on one telltale sign of self-published children’s books—awkward font choice and placement. When choosing a font, you want to select one that complements your story and illustrations—but be careful not to pick one with distracting serifs that may make it difficult for children to read. ‘Curlz’ font may seem like a good idea for a story about Christmas elves, but it belongs nowhere in a children’s book—or really anywhere for that matter. Equally as important as font choice is font placement. Font that is too close to the edge of the page or that runs into the gutter is exceedingly common in self-published books. Almost all of the book samples I received from printers were self-published children’s books, and almost all of them had font that was way too close to the edge of the pages. You want to leave plenty of room for people to curl their fingers around the pages of your book and not cover up any of the text. You also want the font to be balanced on the page with the illustrations and not obscure the images (or vice versa). On a side note about fonts, make sure you have the rights to the fonts used in your book. Many are available free for commercial use, but others are not. If you plan to self-publish under your name or business name, buy your ISBNs directly from Bowker. If you buy your ISBN from anyone other than Bowker, that person/company will be listed as your publisher. (Print On Demand printers who supply a free ISBN will be listed as the publisher.) If you want your business to be listed as the publisher, creating your own publishing house is as simple as registering your business name with your state (and filing ‘Articles of Organization’/‘Certificate of Organization’ if you wish to register your business as a legal entity). A single ISBN costs $125, but the price drops significantly if you buy in bulk. Barcodes are $25. If you plan to print your book in both hardcover and softcover, you will need a different ISBN and barcode for each one. New editions of the book will also require new ISBNs and barcodes. This article goes in depth discussing what constitutes a new edition and answers a lot of other questions about ISNBs. Another note about barcodes—be sure to position the barcode so that it is not too close to the spine or edge of your book. This can make it difficult to scan. Also, make sure you use the proper command to place the .eps file into the program you are using to design your book. Copying and pasting the barcode image, or resizing the image, can cause the barcode to be unscannable. For a list of commands for common designer software and detailed instructions on how to place your barcode, click here. If you plan to market your book to libraries, you won’t want to skip getting an LCCN or a P-CIP (step 6). The LCCN helps libraries find your book, but it is different than an ISBN—only one LCCN will be assigned to a literary work, whereas there could potentially be dozens of ISBNs tied to a single work if it is available in a number of formats or editions. If you’re working with a self-publishing service, some, like Createspace, offer LCCN assignment for a $25 fee. Getting an LCCN is a pretty simple process, and it’s completely free if you do it on your own. I recommend doing it yourself regardless of whether you’re using a service or self-publishing on your own. To apply for an LCCN, you’ll need to have already registered your ISBN. Getting your LCCN is free, which may come as a relief after paying for ISBNs and barcodes. You will start the process by applying for a Preassigned Control Number (PCN) on The Library of Congress website. After you submit your application, your LCCN to be emailed to you within a week. When you receive your final book, you will need to submit a copy of the best edition (i.e. hardcover if you printed both hardcover and softcover) to the Cataloging in Publication Program with the Library of Congress (your book will not be returned). I’ve included the current address at the time of this post below, but you may want to check the Library of Congress website to ensure the address has not changed. Including a P-CIP block on the back of your title page is another important step in making your book more attractive to libraries. The P-CIP block provides bibliographical information that helps libraries properly shelve your book and can help you appear more established as an author. Since you are self-publishing, you won’t be able to get a CIP block through the Library of Congress—that’s reserved for traditionally published books by firms that have published books from at least three authors. You will need to hire someone to prepare a P-CIP block for you. I don’t know of any self-publishing services that offer cataloguing in publication, but some may exist. If you’re using a service like Createspace, you can still apply for a P-CIP block on your own and include it in your book when you upload it. I used Quality Books Inc. for preparing my P-CIP block, but they have since gone out of business. Donahue Group also offers Publisher’s Cataloging-In-Publication. Their service is reasonably priced at $80, and they offer a 3-business day rush service for $115. You own the copyright to your book the moment it is written. But to recover statutory damages or attorney’s fees in the event someone tries to steal your work, you must register your copyright before any infringement occurs. Typically you will wait until you receive your printed book to register your copyright with the US Copyright Office. But if you are concerned about protecting your book before it is printed, you can preregister your copyright. Preregistration is expensive, and, in most cases, unnecessary unless you have reason to believe someone is actively trying to infringe upon your work. After this step, the success of your book will rest in the hands of your marketing plan. In my next post, I’ll be sharing my experience crowdfunding Falafel’s Garden on Kickstarter where I’ll provide tips on crowdfunding and marketing your book. Thank you so much for all of this information!!! The legal mumbo jumbo is the part that I have a huge resistance to! This gives me a checklist of what to do next. You’re so welcome, Meryl! I’m gad you found it helpful! What are the benefits of creating my own publishing house, as opposed to letting Create Space or one of the others being listed as the publisher? I hate paperwork and don’t think I’m going to get rich from my book…..
Hi, Meryl! I only chose to be listed as my own publisher because I wanted to choose my printer. If you don’t have the desire to print the book yourself, then going with Createspace would certainly be less work on your end.